Multiple record association in Zoho CRM. When you manage your sales data in CRM, there is often a need to link two modules. For instance, when you click on an account, you can see the contacts associated with it. As you may already know, this is achieved with the help of a Lookup field which links Accounts with Contacts. However, notice that this lookup field allows the association of multiple contacts to an account - but not multiple accounts to a contact. If at all you have contacts on contract who work with multiple companies, you cannot capture that association in CRM using the lookup field. Similarly, consider the example of an educational institution. A single student may opt for multiple courses. A single cour se may be taken by multiple students - so there i s a two-way multiple association. In systems analysis, this is referred to as many-to-many association. This many-to-many association between two modules in Zoho CRM is created with the help of the multi-select lookup field. Through this field, you can associate multiple students to a course, and vice versa. Also, as part of this multiple association, you can create something called a Linking Module, which will record the details of each association. For instance, a student taking 5 subjects, will have a grade for each subject. 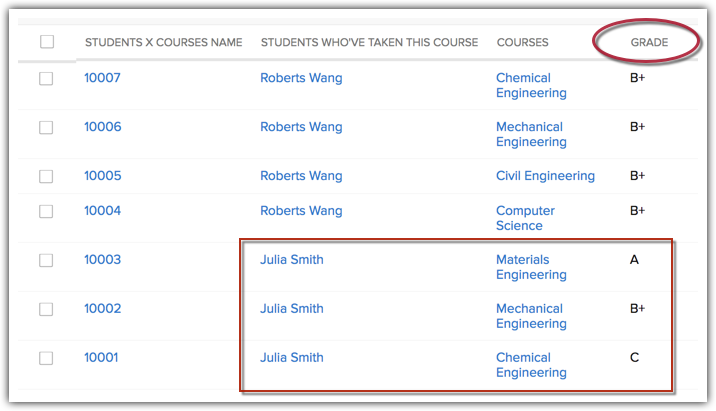 This grade cannot be recorded in the Students module or the Courses module, as it will create duplicates. So you can create something called a Linking module, which will create each association as a record, and you can enter the specific details there. The linking module can be customized. As you can see, the same student has different grades, for each course he/she has taken up. This information can be recorded in the linking module. 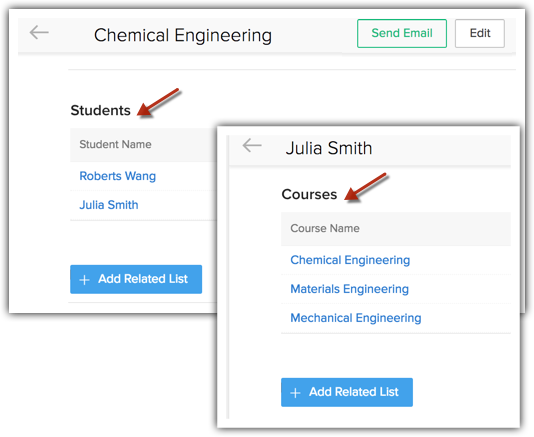 This way, you can associate multiple records from two modules with each other. See Also Multiple Record Association.